Eucalyptus leucoxylon, commonly known as the Yellow Gum, (South Australian) Blue Gum or White Ironbark, is a small to medium-sized tree with rough bark on the lower 1-2 metres of the trunk, above this, the bark becomes smooth with a white, yellow or bluish-grey surface. Adult leaves are stalked, lanceolate to broad-lanceolate, to 13 x 2.5 cm, concolorous, dull, green. Flowers in white, pink or red appear during winter. E. leucoxylon is widely distributed on plains and nearby mountain ranges or coastal South Australia, where it is known as the Blue Gum and extends into the western half of Victoria where it is known as the Yellow gum.The species has been divided into numerous varieties and subspecies. A spectacular red-flowered form of uncertain provenance Eucalyptus leucoxylon ‘Rosea’ (shown here) is widely planted as an ornamental plant, it flowers profusely in winter. A threatened subspecies known as the Bellarine Yellow Gum (Eucalyptus leucoxylon subsp. bellarinensis) is endemic to the Bellarine Peninsula at the south-eastern end of the species' range. The leaves are distilled for the production of cineole based eucalyptus oil. I've seen a lot of these in Maui. These flowers reminds me on the bottlebrush tree, which have a longer flower and is fairly common here in Calif., but I think these have different leaves. Thanks for hosting! This is an interesting and beautiful tropical plant. I am sharing some tropical blooms as well this week. As always, thanks for hosting Nick! Lovely colors. Is it this plant that produce the eucalyptus used as seasoning in throat lozenges? The Gumtree is a Beauty! So stunning. Have a happy Weekend, Nick! 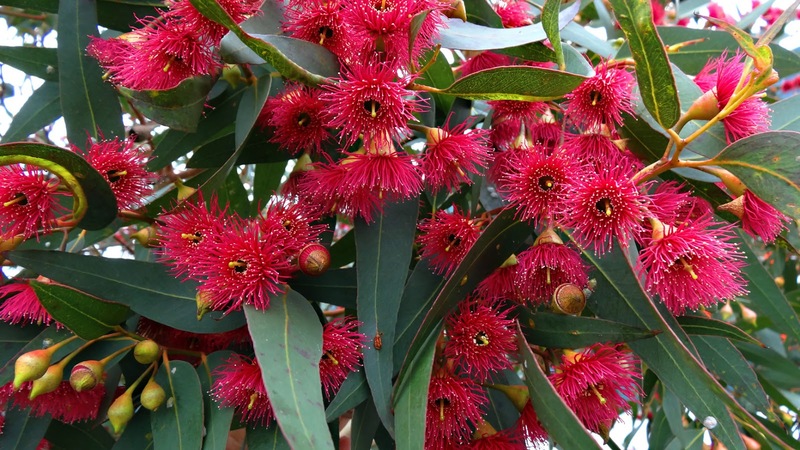 The gum tree produces very beautiful blooms! What a lovely tree with very special flowers! Fascinating tree! Thanks for hosting. Nick, you have found a beauty. Thanks for sharing. Never Seen before. It's really interesting for me. A fantastic capture. I love this extraordinary tree and the blossoms! Wow, I would love to take macros of this beautiful tropical gumtree. Fantastic capure. Have a nice week.